Input text: a metal group faces right. 1st 1 feet tall and 1.5 inch wide tube is -3 inches above and -3.6 inches to the right of and -12.3 inches to the back of the group. it leans 45 degrees to the back. a enormous drop is -0.6 feet above and -0.19 feet to the back of the tube. 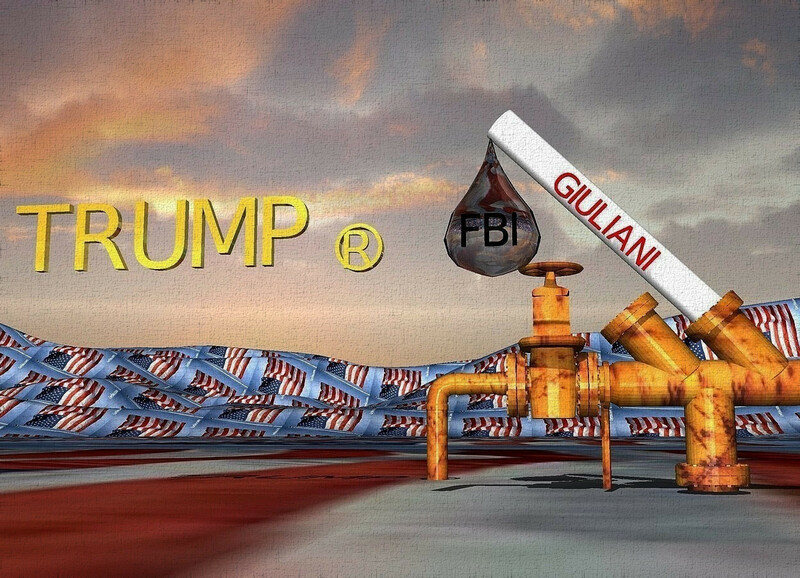 the 1 inch tall red "GIULIANI" is -0.1 inch to the left of and -0.6 feet above the tube. it faces left. it leans 45 degrees to the left. a 1.3 inch tall black "FBI" is -0.43 feet above and -0.028 feet to the left of the drop. it faces left. the ground is 10 feet tall [flag]. 2nd 0.5 inch tall and 2 inch wide gold tube is 0.2 feet behind the drop. it leans 90 degrees to the left. it faces front. a gold 1.6 inch tall "R" is -2 inches above the 2nd tube. it faces left. a 3 inch tall gold "TRUMP" is 0.1 feet behind the "R". it faces left.